Did you have second thoughts while signing a rom-com? I dona��t think therea��s anything wrong with the rom-com genre, just that there are so few of them with a truly original story to tell. A lot of the time youa��re just basically taking the same formula and switching up the actors. Ia��m willing to give this film the benefit of the doubt, even if it turns out to be the same old story. What was that one reason for you to sign Playing it Cool? I read the script and remember laughing out loud a number of times, which is a good thing Secondly, the role is something I can relate to andA�can pull off. In the movie, Ia��m initially a selfish guy going through a phase where Ia��m not looking for a serious relationship, a lot of guys go through this phase in their 20s. Keeping your character in mind, what was it like when you were in school? I had a hard time in school with chicks. I mean I had friends but I did plays went to theatre camps and all (laughs). Who has given you the best love advice? My mum! She told me that the best thing you could give a woman was attention. She said, a�?listen to her instead of trying to impress her.a�� My mum fought for feminism in her day so instilled in me the importance of equality. Which has been your toughest date till today? I went on a date with a girl who I knew was not terribly good with English. But then we got to the date I learnt that she was really bad, she was really really struggling with English. That was one looong date! Where do you see yourself in the coming few years? Settled, hopefully. My 20s was a time for self-exploration and a little self-indulgence. Ia��m at the point now where Ia��m ready to take the next step and settle down. Are you an active philanthropist? IA� am a part of the Gucci family and support Gucci Chime for Change. I personally chime for education and Ia��m the face of the fragrance Gucci Guilty. For me a Gucci Guilty man is daring, sensual, provocative and a risk-taker. 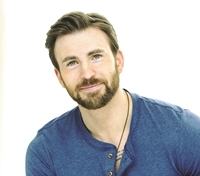 Who is Chris Evans in reality? Well, I was dumped at my senior proma��I was 18 and in love. We danced all night, then she got back together with her ex. It broke my heart. I am a romantic. I hope everyone has those experiences that are so personal that cannot be expressed. It might be a date that lasted just five seconds or a date that lasted all night. Playing is Cool is scheduled to release today.